Normally I don’t get much help gardening apart from lawn mowing, branch removal and that sort of thing. 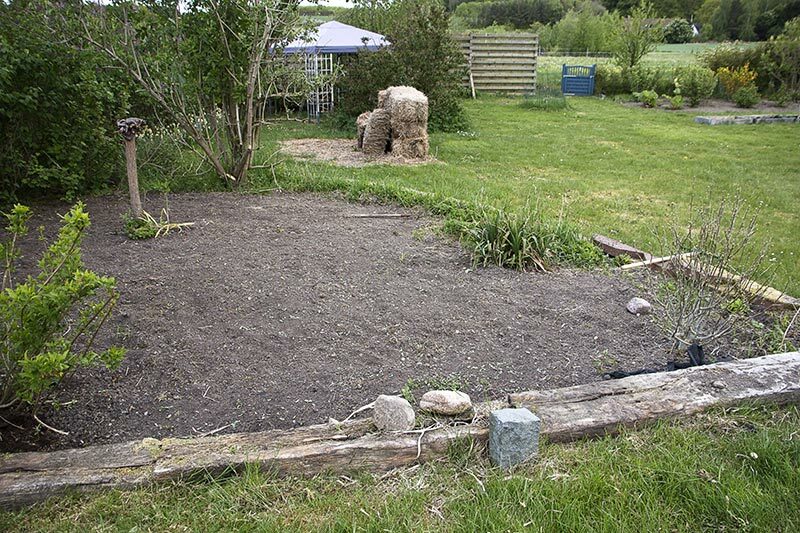 But since absolutely nothing was done last summer due to our bulding project and a miserable spring, I convinced himself to get out the tiller, appointed two beds where nothing had survived and asked to have the roots and crud raked away. And look what an amazing job he did! Now it’s my turn to try to salvage my strawberry plants. Ahem. Can you see them? Somewhere in that dandelion strip right there… These are much better berries than any modern plants, so I stubbornly fight to keep them alive. Unfortunately I’m so slow that the ground has dried up and I can’t even hack through it with a spade, much less pull out deep rooted grass and weeds. 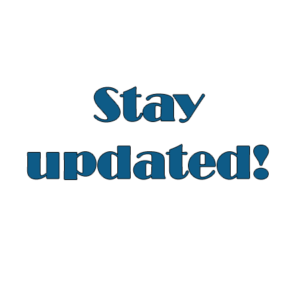 So now we’re just looking at a cold week ahead, hopefully with some water in it, so I can move as many strawberries as possible and start improving that concrete with compost. I’m uncertain about the asparagus, when to move them safely, but I guess I’ll have to look it up. Keeping a garden in heavy clay with weeds from the fields blowing in is really a back buster. I’m trying to find ways to convert it to a low maintenance area. 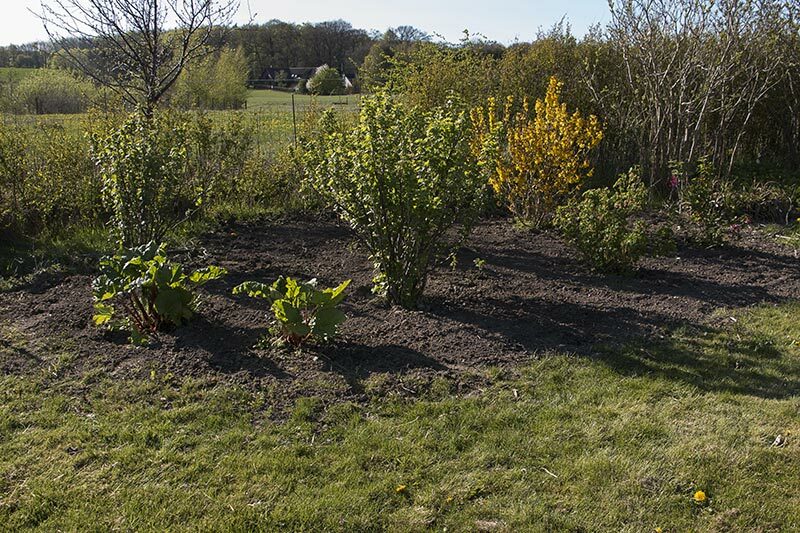 For now the decision is sort of counterintuitive, keep the open, bare beds which makes the weeding much faster. Improve the soil, a year, two? Keep turning it over. Because every time I’m tempted to plant something, grass happens. And don’t talk to me about various covers. 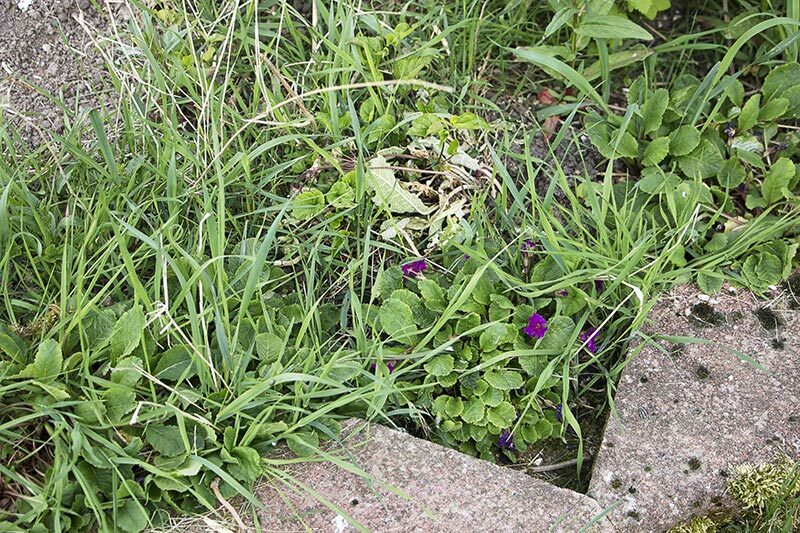 Weeds grow just fine on and through anything I’ve tried, but you can no longer hack at them. G did this bed as well, although the edge is mine if I want to preserve the primula. There’s already green sprouting, but now it’s mostly borage which comes back every year. I’m sure a few Celandine will appear too as well as the huge bags of marigolds and purple poppies that I showered it with. There’s weeds you know, and there’s weeds. And they can all be tilled and cleaned out again in the fall. Unless we get two months of rain, in which case I don’t maintain it and we’ll have to start over. 😉 Still, tilling takes a day, handweeding takes me weeks. i’d be there in a flash to help if i could! we’re rotor-tilling tomorrow too–we have clay soil too that the long grasses just adore –you’d never know we did the whole thing last year as it’s half grown in again! Garden takes dedication. If I ever move to another house, I’ll look for one with a “nature” garden. Just trees, heather, footpaths, that sort of thing. Flyt jordbærrene op i de fine højbede – med en greb kan det gøres nu, ligesom jeg gjorde. “Grass happens”, jeps også i den grad, men hvis du dækker jordbærrene med halm, ligger rødderne øverligt, og kan lettere (ikke let, men lettere) hales ud. Jeg tror vi har samme jordbund – stiv lerjord, med pletvis faktisk brugbar blåler – og samme græs, der kan forcere bedkanter, fliser osv, med udløbere så lange som en lørdag med regnvejr. Du har heste, så spred et tykt lag hestepærer på alle bedene, det har jeg gjort (jeg må tage alle de hestepærer, jeg orker i naboens hesteskur 🙂 ), og hvor jeg før knækkede mindst en lille haveskovl om måneden, har jeg lige oplevet at den første knækkede fordi træet var mørt! Jeg er nødt til at vente på regn, jeg kan end ikke banke et søm i jorden hvor jordbærrene står. Jeg ville ødelægge både rødder og mine hænder hvis jeg forsøger at grave dem op nu, men højbedene er klar! Ellers synes jeg at halm på jordbær mest har den effekt at sneglene i ro og fred kan æde dem allesammen…. Så håber jeg at det har regnet rigtig meget på dine bede i det fiorgangne døgn. Jeg har også et enkelt “cementbed” der har brug for regn, før græsset kan fjernes. Det var bart sidste år, nu kan det næsten dublere som græsplæne! Weeds are the bane of my life at the moment, soul destroying really but I do love my garden overall, it just makes me cry sometimes. I have bindweed, couch grass, celandines, spanish bluebells, creeping jenny and speedwell, mostly quite pretty but not on masse. Good luck with your weeds. It’s just part of May I guess, the shock of coming out of hibernation and then everything explodes at once. But my landlady hates them, so I weed my garden every week and sigh. Have fun with your new season of gardening. I hope it all goes well and you get just the weather you need for it. weeds are in the eye of the beholder. what some may call weeds I call native plants. 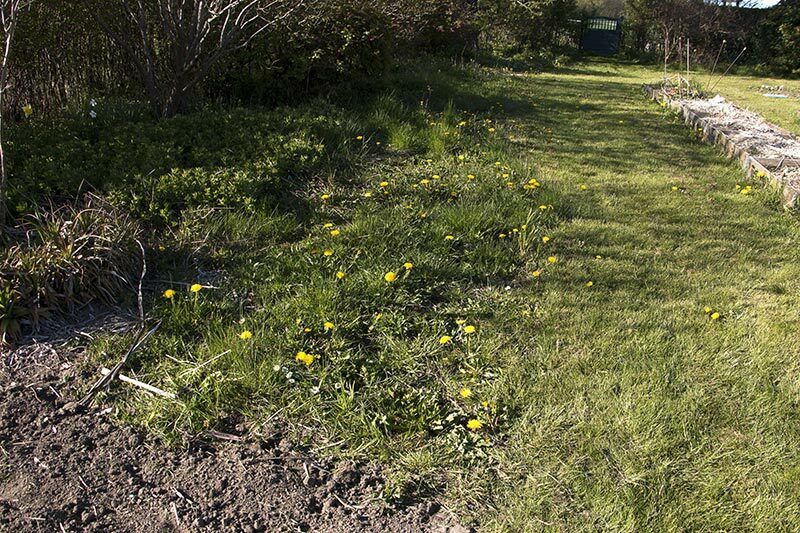 but sometimes a native plant tries to overtake the whole garden bed so it needs to be thinned. my neighbor has a more tradition garden than I do and grows lots of vegies, she shudders when someone offers to rototill because tilling and digging brings the weed seeds up and then they sprout. instead she mulches heavily with leaves in fall which enriches her soil and keeps the weeds down. the few weeds that dare to grow in her garden are easy to pull out. I have seeds flying in from the fields, thistles, dandelion. Every time I try the easy way with ground cover I end up losing plants, especially my dye plants don’t survive. And I can’t keep up with spot weeding, my hands and back (and time) won’t allow it. My mom used to have soil like that, and she tried everything you have mentioned and that has been suggested here. he had a beautiful lawn, but really struggled with her gardens. She finally had the whole thing dug out, a foot deep, and real soil brought in. It was a major task, but suddenly everything about her garden got easier and beautiful. She saved for a long time to get the money to do it, but it was well worth it in the end. If I were to start over in a smaller space, I think it’s exactly what I’d do though. 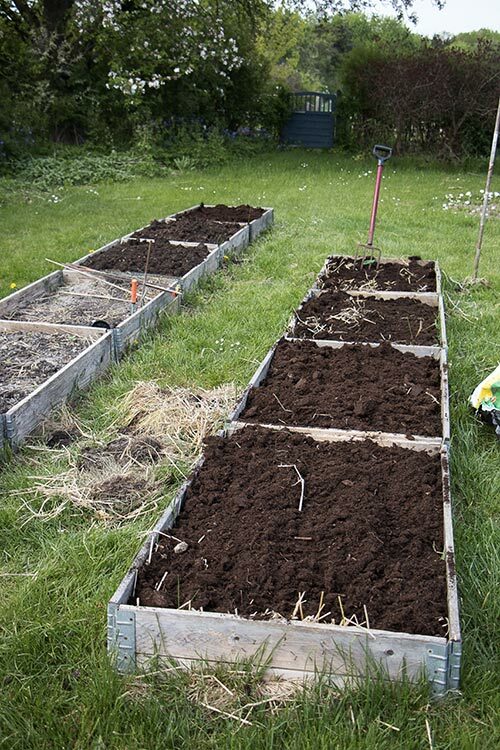 For now, I just apply it to my raised beds, the soil in there is so easy. I can imagine the moisture sinks right down below root level. We’ve contemplated sand, along with the horse manure and straw for soil improvement here. Some compost has already been mixed in, but not enough apparently. But since G has zero interest in how things look, or homegrown vegetables, it’s all on me even if he’ll lend the occasional muscle without complaining. He just doesn’t want to have to think about it. Haha, I suppose you’re right, or bricks at least. Love the phrase: every time I’m tempted to plant something, grass happens.